If you enjoyed Snoopy Flying Ace, then you'll be excited to hear that Smart Bomb Interactive is working on a new (free) flight combat title for web browsers. When Snoopy Flying Ace came out for XBLA and PSN this summer, a lot of folks were surprised at just how good it actually turned out to be. Now, developer Smart Bomb Interactive has revealed its next project is another ace combat title, though this one will be playable on the Web and won't cost you a dime. This new game is called Sky Legends and is planned to launch sometime in the first half of 2011. The official website doesn't have much on it yet, though it does have some teaser footage and artwork that looks like it features play mechanics and visual styles similar to Snoopy Flying Ace (which is by no means a bad thing). Sky Legends is a browser-based, free-to-play, online multiplayer flight combat game featuring intuitive flight controls, intense aerial combat, and outstanding graphics! 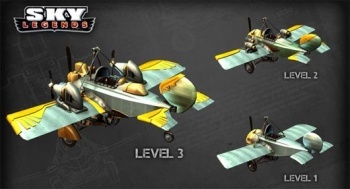 With a wide range of PvP game modes, upgradeable and customizable airplanes, and a full range of unique weaponry, Sky Legends offers endlessly replayable short-session gaming. Compete as a lone pilot or with a Squadron to sharpen your skills and prove once-and-for-all that you are the top ace! Overall, the game sounds great. If Smart Bomb keeps on putting out solid air combat titles, maybe Microsoft will hire them to put out a sequel to Crimson Skies: High Road to Revenge, which would allow me to die happy.